[Ultimate Stride] (Released when the number of face up cards in your G zone is three or more! When it returns to the G zone, remove your G zone! )-Stride Step-[Choose a card with the same card name as your vanguard from your hand, and discard it] Stride this card on your (VC) from face down. [AUTO]:[Counter Blast (2)] When this unit is placed on (VC), you may pay the cost. If you do, search your deck for four cards, shuffle your deck, call two cards from among them to separate (RC), and put the rest on the top of your deck in any order. Until end of turn, choose all of your units for your trigger effects. Haven’t seen a lot of this. Pity. Ultima’s actually pretty decent. Not the best Zeroth Dragon but he does what he does well. Best thing he has going for him is to stack a Stand and a Critical Trigger together so that everything gets to attack again forcing 20k guard with Criticals stacked on assuming normal columns, and to 3 to pass him you need to throw in an extra 20k guard, since each trigger will cause his column to shoot up by 10k total. But if that’s the case realistically you’d throw a Perfect Guard at him so that’s pretty redundant. He’s not perfect, obviously. Denial Griffin will only continue to make him very unhappy unless you are using Blasters with Gancelot Peace Saver, so he’s only really there for the ‘I need hand destroyed and I’m not fussed about the consequences’ plays. 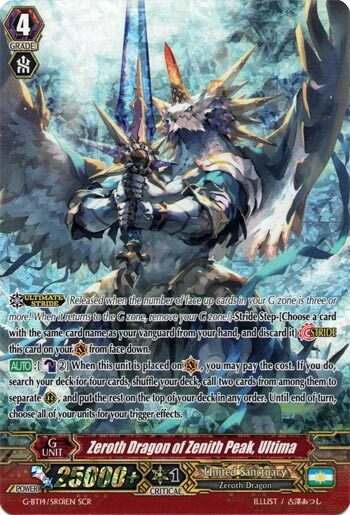 Best used in: Rescue, since Gavrail Prim can Rescue Check your stacked Critical and you can Drive Check your Stand, Luard because it’s Luard and that’s always good, Blasters, although you might not want to force yourself to run Stands because of him when Criticals do a better job. What’s up, Rogue Squad?! Today, we get to look at one of the two newest Zeroth Dragons released in the new set, and although this one may seem like the inferior one of the two, both of them are nothing short of phenomenal as I personally have placed both of them as two of the better Zeroths in the game (more info on my channel). As for today’s card, Ultima, the fact that not only are you allowed to call two units from your deck, but you can also stack two cards on top of your deck as well. The optimal plays are either two critical or a Crit and a Stand for extra rear-guard attacks, and the fact that everybody gets to share the wealth of the triggers’ powers makes it so that the opponent would have to throw out an extreme amount of cards from their hand unless they have enough Perfect Guards to compensate for the pumped up attacks. The ideal decks that can run this smoothly are Luard (as Dragfall can Ultimate Stride easily by his skill), Blasters (especially if you want to abuse Flogal after the drive checks and have a Gancelot Peace Saver face up to dent Denial Griffin and Heteroround) and recently in Japan, Nociel/Rescue decks have been seeing great success with it. In short, this is one of those Zeroth Dragons where you should try to find room for it because it’s a hell of a doozy once you get it out to the field. Next Time: The one card that most people that aren’t Gearheads are complaining about.